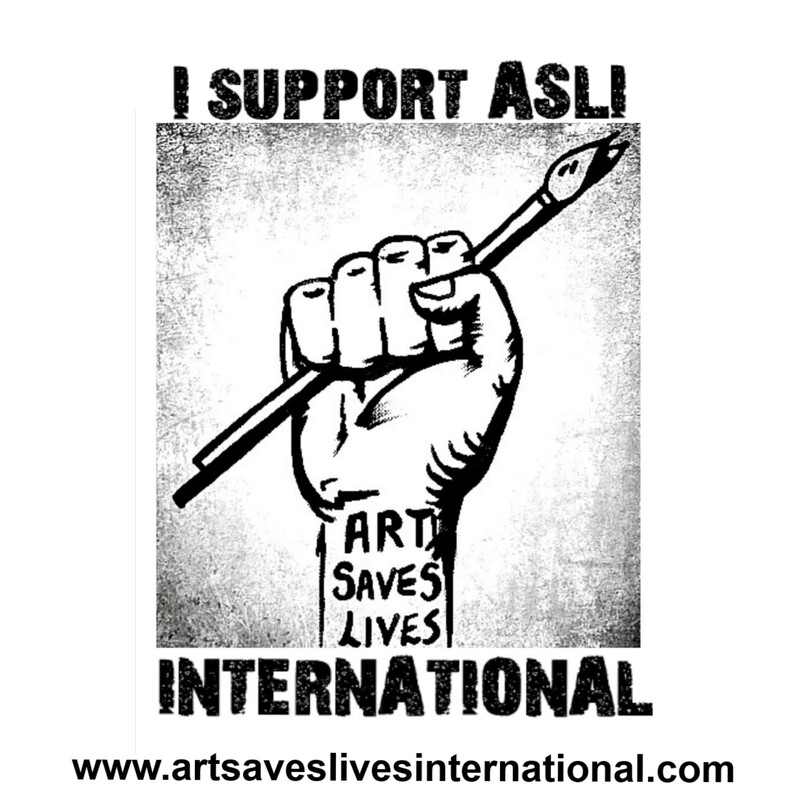 Art Saves Lives International are committed to elevating artists who use their work to create change. Denny Reader is an ASLI artist who we feel needs to be heard. With his complex art and insightful poetry, depicting experiences of his own schizophrenia, the inner world of psychosis and the ways in which Denny makes sense of this all – with elements of the mystical and the transcendence of consciousness, Denny takes you into his mind. Please tell us what your current creative project is? My most current project is working on promoting this Poetry, Art and Aphorisms book called ‘Wondering Whispers’ in e-book form and getting some paperback versions completed as well. I’m also getting back into making Art again, after a short break from creating, I have lots of ideas to get down to. This is my second book of Poetry, the first one I had published with Chipmunka Publishing which is still available from their site, but in this e-book I’ve included some of my best artwork and also aphorisms that have inspired me and ones I’ve made up myself. I’m also working towards having a collection of my art exhibited at some point, all upon the theme of schizophrenia, the experience of voices and the mystical element that can feature in many people’s psychosis. To get this book out there in the relevant places and also to get back towards an active creative practice, creating Art and Poetry regularly, hopefully creating work that I’m proud to share and build a collection towards a third book. Also to keep being active and productive, to maybe try some other art mediums like working with oils, collage and to hone in my poetry. Mostly though to get the exposure for this e-book and to get my mental health back on track, because I’ve been mostly very unwell in recent years and I aspire to finding balance within my mind and life once again. What do you hope to achieve with your new work? A theme in all of my work really, is to inspire and enlighten people to see things differently, truthfully, authentically and hopefully to a more open-minded perspective, to portray my experiences of schizophrenia, psychosis, mysticism and life experiences in its raw and honest form. I believe in creativity for everyone, people empowering and sharing themselves through all the various art forms genuinely, realistically and also when needed in a therapeutic manner. This way I feel we can all connect to our deeper more authentic and spiritual nature and lessen the pain and burden that human life can so often bring to so many of us. With this book in particular, I’ve attempted to capture a sense of change and hope in the world, expressed through Poetry, Art and Aphorisms and really I just wish to share what I’ve gone through. I wish to bring some enjoyment and insight into my work and to share my inspiration in the hope that others can relate to it and gain something in their lives because of what I’ve been through. Tell us why you do what you do? I do what I do because I love and have great passion for Poetry, Art, Aphorisms and in all honesty I love all Art forms. I believe that Poetry, Art and other mediums literally grasp upon a greater underlying reality of life, it gives us a greater perspective, often a different and more beautiful one. It can put us in the shoes of others, portray meaning, beauty, intellect and I believe really add to our lives. I mean, what would life be like without Art, Poetry, Music, Drama, Creative Writing? I believe it connects us on a deeper level and opens us to a greater sense of life, perspective and well-being. I thoroughly believe in it also for its therapeutic value, Poetry and Art especially, has been a God send for me over the years, a way to express myself to the world, a way to vent, a way to translate experiences that I would not be able to in any other way. The process in itself is cathartic, even if I didn’t share any of my work, I feel that it would still have great value to myself for its ability to transmute, transform and express the mind, the emotions and experiences into a solid form. To put into form, that which otherwise would remain stagnant within the soul and mind. Tell us about your process in creating your recent work? Well all the content in this book, is a collection of my best work from the last five years. When I’m in a flow of Poetry writing I can sometimes write two or three a day and ideas just flood my mind, often too many to record. I often can’t sleep because of seemingly important creative ideas, themes, concepts, images and visions come into my mind regularly, in the past at times it has stopped me from sleeping and I’ve had to learn to shut this creative force out, so I can get on and do other things, like sleeping and living daily life. Much of my inspiration comes from my sensitivity to things, from nature, from music, people and I like to think from my within myself and my soul. Sometimes when writing a poem, I take a notepad out to a quiet place in nature and sit with my feelings to see what comes out and through, many other times I note down ideas in my notepad and later return to encapsulate upon it when at home and in the quiet. I would say being still as one can in the mind, is often the best way that ideas come through and meditation can help greatly with this. My recent Artwork, is largely inspired by my latest episode of psychosis and OCD, which has really been a struggle to get through. Voices, paranoia and intrusive thoughts have really crippled me in recent years, but I’m learning to deal with this most recent collection of symptoms and making Art and Poetry to express this. Much of my past work, the Poetry and Art that I’ve done and the Aphorisms, have mainly been inspired by my experiences of Psychosis and Mysticism. Most of the content of my creative work is depicting these various experiences, of themes to do with my spirituality directly relating to psychosis and the shamanic and mystical phenomenon that I’ve gone through, ie – having outer body experiences, communicating with various spirits etc. – Much of this could be considered delusional, but I take the shamanic stance on these experiences, they are so real to me, more than daily life, they give me intense meaning in my world and have formed my outlook and philosophy in which I live my life by . Much of it also is just about my take on the trials of being a human being in a fast paced competitive culture and how I deal with my schizophrenia whilst also dealing with this mad world. I’ve made a previous poetry book to this one, it was published in 2011 by Chipmunka Publishing, it contains only poetry and is titled ‘Inside the Outside’ and is still available to buy through the Chipmunka website and through Amazon as an e-book. Other than this, I’ve had art exhibitions in the past and have been writing Poetry and Creating Art on and off since I was a child, though I do go through periods where I struggle to get the motivation to carry through my ideas. Does your art help you in any way, therapeutically? Definitely it does, I believe it helps me reach higher states of consciousness, to escape at least temporarily from the binding of the human ego and all the pain associated with life. It gives me a vehicle in which to share with the world, to transmute my feelings and experiences into a concrete and solid form. Personal development comes to mind when thinking of creativity, the ability and means to express oneself can help tremendously in one’s personal sense of well-being and interpersonal development. As keeping a diary can help a person realise their true feelings and see more sense in how they think and feel, so too can Art help a person in being more expressed, self-content and in many ways more self-actualised and resolved. Has your art saved your life in any way? I wouldn’t say it has actually saved my life, but it has definitely helped to make it. It has made it fuller, realer, more clear, it has paved the way for me to have an outlet in this world and life, without it, I would feel ‘boxed in’, stagnant, blocked and without a voice. Art certainly enhances my life tremendously, my Art and Poetry has given me great meaning and has had an enormous cathartic influence within me. I still have tons of new stuff every so often to process and work through, with my condition as it is, but Art in all its various forms gives me a vehicle in which to process and like I’ve said, to transmute it, express it and hopefully help resolve myself much more. Which artists do you feel inspired by right now? I feel mostly inspired by musicians as of late, I constantly have music playing in my room where I work and often have music for all types of moods and emotions. I love rock and some pop for feeling more energetic, chill out music for a more softer mood, like world music and singer/songwriter tunes and I’m always playing a song in my head as I go by my daily activities. Coming to Art, I will forever love and be inspired by the artwork of Marc Chagall, with his dreamy and colourful paintings, Dali and similar other psychedelic artists, for their transcendental affect on the psyche. I love fantasy Art too and am actually very inspired right now by computer games such as Skyrim, one of the Elder Scroll games for the xbox . The landscapes, characters, monsters, music and whole experience of some console games can be so enthralling and inspiring, they can really give you a taste of a fantasy world, a world unlike our own, free from the normal constraints of human life. Do you hope to create change with your art? I hope to bring about more awareness with my mental health campaigning and many of the issues in my work are of a mental health nature, but also on a deeper, spiritual level, I adhere to bring understanding, compassion and loving kindness to my work wherever I can, compassion and understanding of the human condition in its myriad and many forms. I also do like at times to put a political edge upon what I create, I feel that on a spiritual path and being an artist, that we shouldn’t shy away from expressing our political views and the injustices we see in this World, in fact I would say that in this position of being an artist, that it is our place to express our experiences and inspire others to see things in another hopefully broader more truthful light, or to see things in a different way if we can. Do you have any particular causes and campaigns your art is in aid of? Yes definitely, I feel my Art and Poetry at least portrays what it’s like to have mental health issues, to bring awareness to people upon psychosis and what this can be like, but also hopefully on a more existential level too, I like to think that I bring spirituality and meaning to my work, not in a dogmatic sense, but hopefully on a deep level on what it’s like to be human and deeply feel things in this crazy world. I am very passionate about expressing my experiences in an authentic manner, whether it’s positive or negative, expressed with a dark twist or in the light of something spiritual. I like to think that through Art and Poetry I can give an accurate and descriptive take on schizophrenia and also it’s shamanic element, but more deeply, just to express what it is like being a sensitive, feeling human being in a harsh and competitive society, to express the injustices and rawness of being alive here in the 21st century. In the past I’ve done campaigning on Environmental issues and in mental health, these subjects I’m very passionate about, I like to bring an mind opening, cathartic, therapeutic and compassionate stance in my Poetry and in my Art I love to express the raw and also sometimes brutal experiences of mental illness. I love to use lots of colours in my Art and generally just be authentic with my experiences, to hopefully open the minds of the viewers and give people something to relate to and/or be made aware of. What are your plans for future work? To just keep creating mostly, I’ve got two other book projects in mind, one to make a self -help and exploratory book upon psychosis, it’s various cultural perspectives and also various anonymous personal accounts from people about what helped them upon their own road to recovery and exploring psychosis with all it’s fascinating phenomena. The other book project, a long term goal is to write out a personal story of my breakdown and ongoing experiences of schizophrenia, I think this will be a cathartic process and also something people with similar life experiences and those interested will be able to relate to. Mostly to keep making Art and get back into writing Poetry regularly again, hopefully towards another Poetry book as well. I’d also like to exhibit in an art gallery with the series of Artwork about psychosis that I’ve done, but yeah, just generally to keep creating, keep an active practice of staying motivated and inspired and put that into motion, regularly finding the energy to keep making and creating. Please read: Denny Reader talks to ASLI about his schizophrenia and using his creativity, saying “Its gives me a purpose and a platform to share my ideas and myself with the world around me”.